A door frame acts as a decorative overlay to the opening of the gas stove, providing the desired appearance. 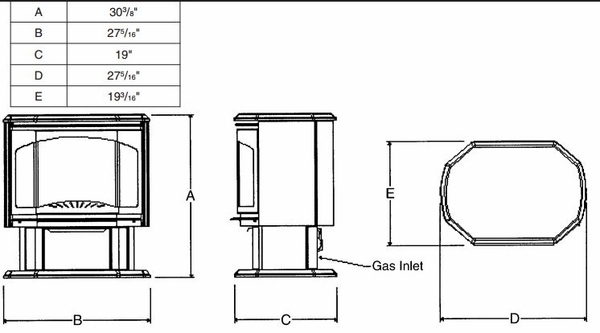 A log set is required to complete the look of the gas burner assembly. The logs within this set will be molded to fit the exact burner used in this model. An optional louver finish will allow the stove to be accented as desired. * Please Note: Stove pictured with optional gold louver, which can be purchased separately if desired. Forget about chimneys and ventilation--the Kingsman FVF350 Free Standing Vent Free Stove has the ability to keep your room warm without them. Kingsman vent free stoves use room air for combustion and exhaust to the room, but an ODS pilot system will automatically shut down the burner systems room oxygen levels aren't sufficient. 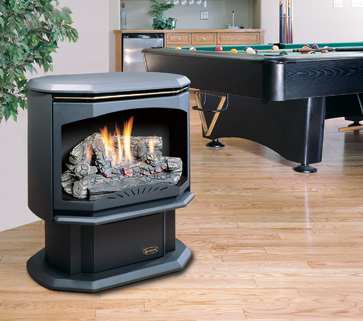 Listed in the USA as a Vent Free Firebox, this stove is black with a classic louver. 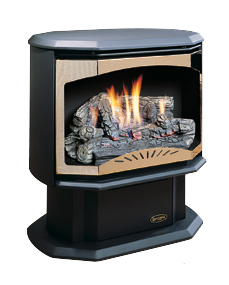 It is available only with Millivolt controls, and the gas combustible stove burns at 40,000 BTUs. It is tested for function and quality and stands at 28". Does this have a remote control? This stove does not include a remote control but you can add either a basic on/off or an on/off thermostat remote separately if desired. Does this include the pedestal? Yes, this includes the pedestal, but you still must add the burner assembly, log set, and door frame of your choice to complete the stove assembly. All listed indoor ventless systems like the product in question will be 99.9% efficient. Kingsman is a Canadian based company and as such would work under their standards. How far from the wall does this have to be? This must be installed 3" away from a wall. Does this come with a remote and blower? For this stove, the remote and the blower are available as options. Does the top of the stove get hot enough to cook on? It will not. Surface temperatures of this stove will not exceed approximately 120 degrees, as the vent free design allows most of the heat to flow from the opening of the unit. How many square feet will this Kingsman FVF350 free standing vent free stove heat? With standard 8' ceilings, this stove will heat approximately 714 square feet with natural gas and 771 square feet with liquid propane.